*Are you located in Alaska, Hawaii, or outside of the U.S. entirely and want to place an order? Please contact Caroll Berridge at [email protected] or 1-866-872-4687. Volume discounts available. If you have any questions, please call us at (866) 872-4687 or send an email to [email protected]. Thank you so much for everything, we are truly excited to move forward in utilizing both tools in our program. I think the YJT tool will be a perfect fit for our program because it is parent friendly, simple to use and easy for staff to follow and understand. To be honest, it’s an affordable option as well which is important. Our next step is for both the Family Services Team and the Education Team to meet and work on the specifics of moving forward with both. We heard of YJT after we had watched a webinar for the eDECA. When the webinar was over, we did some exploring on the website and saw the YJT. I knew the Family Team was looking for a curriculum to use with families so I researched it a little more then gave the information to our Head Start Director and Family Team Manager. The fact that the 2 (DECA and YJT) could work together to support children and families was most appealing to us. So many times we end up with all these separate pieces and we have to try and show staff how they work together…. DECA and YJT did that work for us. Interested in the DECA Program to support your use of YJT? Learn more and order the the online e-DECA system here. Purchase the paper DECA for Infants, Toddlers, and/or Preschoolers by clicking on the links. See all of our resources and a purchasing guide here. The lessons associated with each module are designed to show parents how everyday routines, activities, and interactions help promote resilience in young children and the adults caring for them. 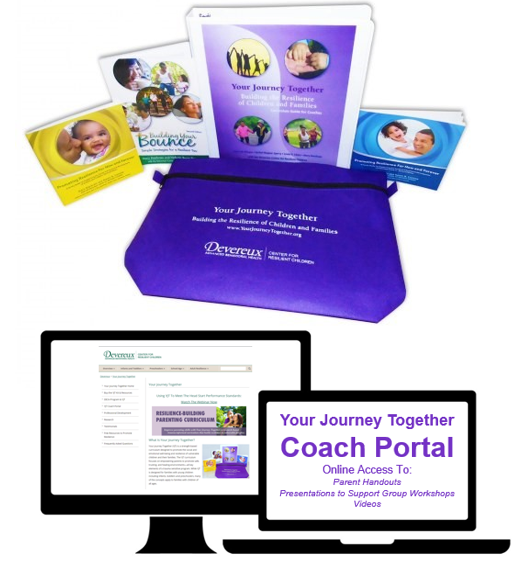 The Coach Guide is supplemented by the adult resilience journal, parent guides and strategy resources, and access to the online YJT Coach Portal.